Thanks to this Sofia The First Light Switch Plate turning on the light will be fun again. If your child loves Sofia The First and would like to get this princess in the bedroom then now you can add this light switch cover to the room. 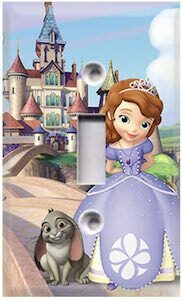 On the switch plate you can see the castle in the background and in front of it you can see Sofia The First and next to her Clover her furry friend. Your little princess of course deserves a nice lunch box with a little princess on it. 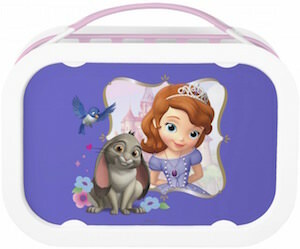 And now there is the perfect lunch box with Sofia The first and her animal friends on it. This lunch box made by Yubo is easy to clean as it everything can go in the dishwasher except the picture of Sofia that you find on the front and back. In side the lunch box you find a ice pack, sandwich box and two small snack boxes. And yes everything is BPA and phthalate-free. Now going to school will be fun as you can bring Sofia, Mia and Clover as they are printed on your lunch box. Kids and adults that like little Disney princesses will love this Sophia the First water bottle. The stainless steel water bottle is available in many fun colors to make everyone happy if they get a Sophia water bottle. This water bottle is 24 oz in capacity and is 100% BPA free and is spill and crack proof making it perfect for school, trips and at home. On the water bottle you can of course find Sophia the First an her animal friends Clover and Mia. It maybe time to surprise someone with a special Sophia the First water bottle that even has a loop so that you can hang it on a backpack or something. If cupcakes are the party cake of choice and the the theme is Sofia the First then some fun cupcake rings would be perfect to decorate. These Sofia The First cupcake rings come in a pack of 12 and shows Sofia, Clover and Mia and the rings come in pink and purple colors to make them even more princess like. Besides being great for cupcakes these Sofia The First cupcake rings are also great as party favor or to decorate a big cake. A Sofia The First birthday party would become so much better if you use these fun cake decorations. You should take a closer look at these Sofia The First Cupcake Rings. Now you can eat with a future princess as this Sofia The First Placemat will be perfect to eat on while you stare at your favorite Disney character Sofia. This Sofia The First placemat comes in a set of two (both same design) and is 17 x 11 inch. 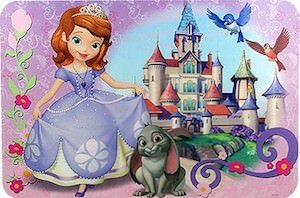 And on this placemat you can find of course Sofia The First and she has the castle in the background and her friend Clover the rabbit and the birds Mia and Robin. This all makes for a fun placemat that will prevent food from spilling on the table. A true princes’ party, of course, has princess napkins. And if your favorite princess is Sofia the First then you want Sofia the First napkins. Now there are these fun napkins that are pink and have a big picture of Sofia in the middle together with her friends Mia and Clover. These fun napkins come in a pack of 16 making them perfect for kids birthday parties. Start working on your Sofia the First birthday party you daughter is gone love it especially if there are these special napkins. The adorable, cute and of course fun Princess Sofia is ready to help you have a magical princess sleep. This is a nightgown that featues a large image of Princess Sofia from the Disney series Sofia The First, also surrounding her are some of her cute animal friends, Clover the bunny and Mia the bird and find pink magical flowers aswell as a large purple bow. You can find this Disney Princess Sofia The First nightgown in a wide variety of sizes, make this nightgown your favorite night time pajamas and have many wonderful sleeps with Sofia The First. 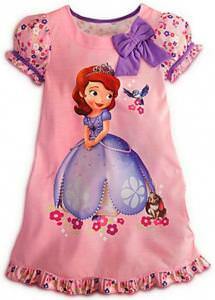 Add some Disney magic to your sleep with the Disney Princess Sofia The First Nightgown. 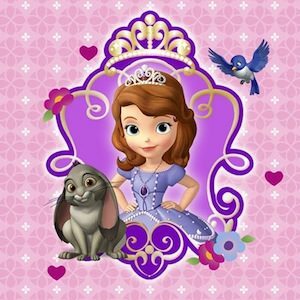 Disney Princess Sofia, stars in the cool series and movie of Sofia The first, she has many little fun character creatures. This is one of the fun little creatures, meet Clover bunny rabbit a very friendly and really adorable bunny rabbit that you can now have all to yourself. With all of the cute features you find on Clover bunny rabbit all in a very durable and super soft and snuggly bean bag plush, and this Clover bunny rabbit measures 7 inches in height. 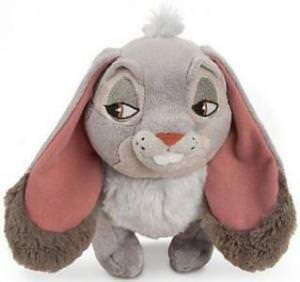 Get your own Disney Sofia the First Clover Bunny Rabbit Bean Bag Plush 7”.